• Put the butter and sugar to melt together and immediately add the milk, yeast and egg, stirring with wire whisk. Leave aside for 3-4 minutes. • In a bowl, mix the flour and salt and pour in the milk mixture. Continue stirring, leaving the mixture in a warm place for an hour, until it swells. • Heat a frying pan and add a bit of olive oil. Pour in a full tablespoon for each muffin and bake each side for 4 minutes. • Melt the butter. Until it’s fully melted, beat the eggs and vinegar in a bowl with the wire whisk. • Remove the butter from heat and, hot as it is, pour it slowly into the egg mixture, beating constantly with the wire. • Add the mustard, salt and pepper and leave aside. • In a saucepan, boil water with 2-3 tablespoons of vinegar. • Place the eggs into small bowls and lower the heat when the water comes to a boil. • Add the eggs carefully and leave them for 4 minutes. • Open the buns in half and put them in a dish. • Cut the avocado into thin slices, and carefully place them on the buns. 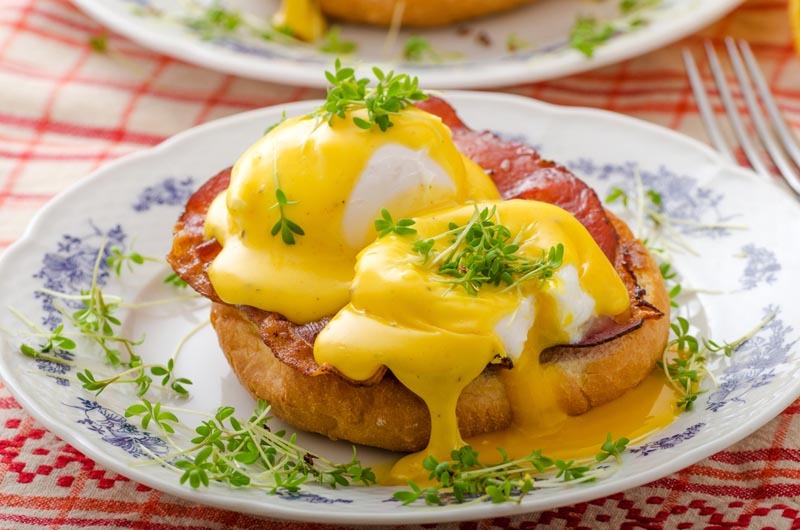 • Put the poached eggs and 3-4 tablespoons of Hollandaise sauce (per serving) on top of the buns. • Serve with the slices of prosciutto and freshly ground pepper. Replace the bacon with smoked turkey or ham. Use yogurt and a smaller quantity of butter for the sauce. As for the eggs, you can always bake them in the oven.